Even though she was born and raised in Lebanon, Isla’s first and strongest language is English. There are two main reasons her English is much stronger. One, Beirut. English is so prevalent here, and Isla is clearly a foreigner, so people just assume she doesn’t speak Arabic. Even though we insist that people use Arabic so that she can learn, they rarely do. So her Arabic input has never been high enough. When someone asks her a question in Arabic, she replies in English and they understand her, it just reinforces to her that she doesn’t actually need Arabic. 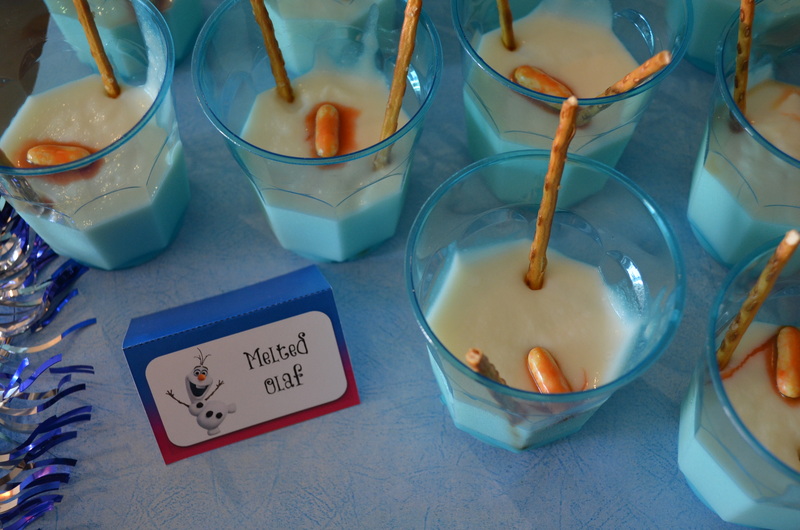 I kind of have this rule about birthday parties… I learned pretty quickly that small kids could care less about how well the food matches the theme of a party and it’s just not worth the effort to be creative with party food for a 4 or 5 year old’s birthday. 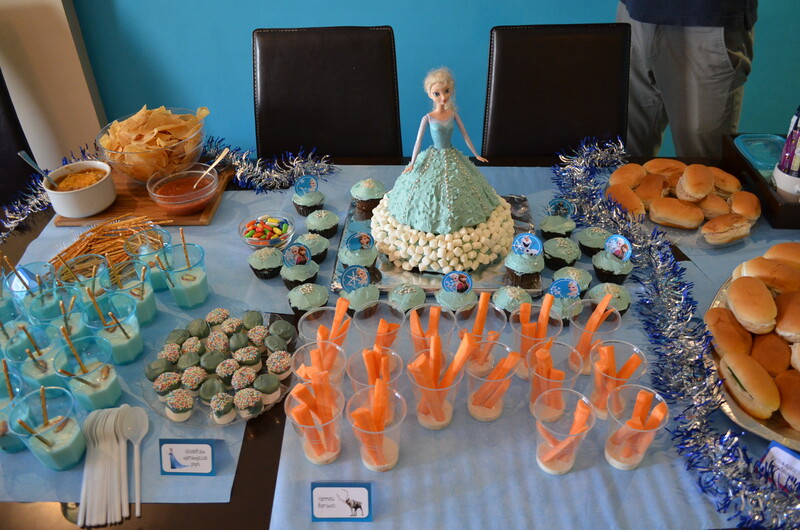 But as I was planning Isla’s Frozen party for her 5th birthday, there were just too many snack ideas that fit so perfectly, that I decided to break my rule and do a lot of food that fit the Frozen theme. 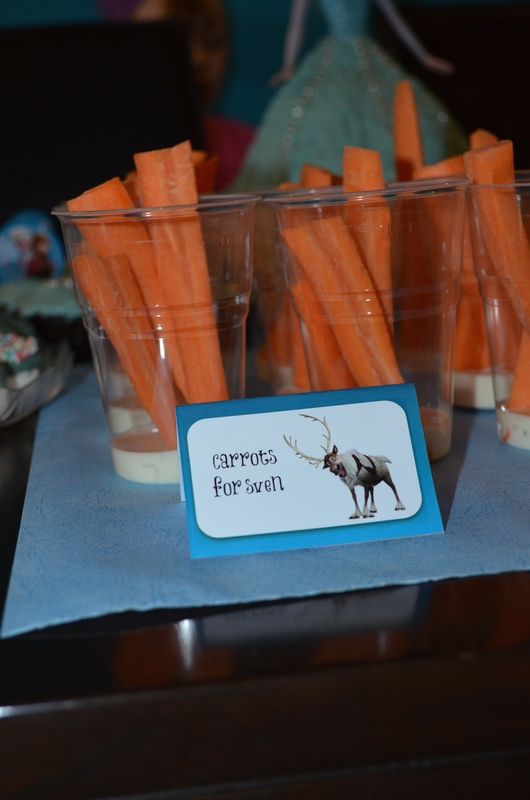 … plus marshmallow snowdrops, Anna & Hans’ sandwiches, a plate full of Olaf’s arms (pretzels) and chips and salsa for the grown ups. Speaking of the cake, I decided to try my hand at one of those princess doll cakes. I was really nervous it would be a flop, literally, so I made a bunch of cupcakes too, just in case. But it was actually much easier than I was expecting. I used a bundt cake on top of a small pie shaped cake. 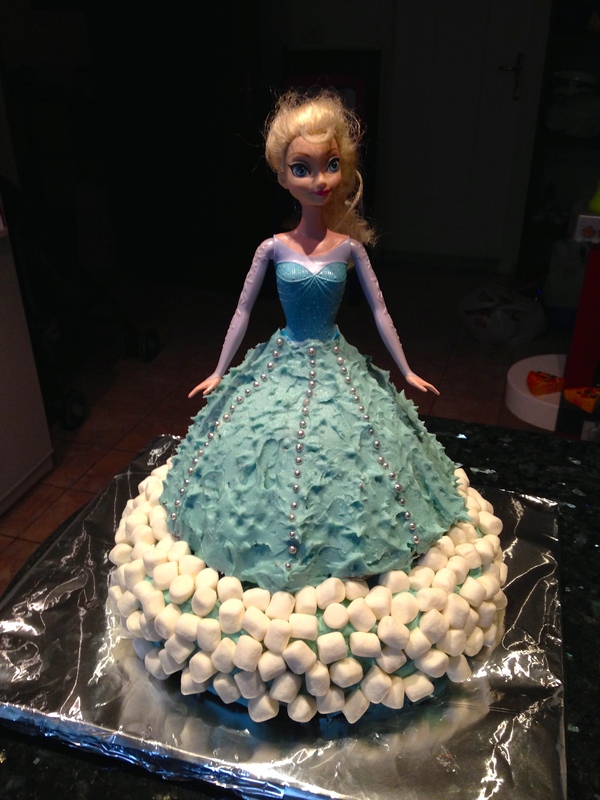 Didn’t really carve it, just stuck Elsa in the middle and used frosting to shape the dress. Isla doesn’t like games where anyone loses or anything that puts her on the spot (pin the anything on anything, for example… she can’t handle everyone watching her and cries every time). So we decided to do more activities instead of games. 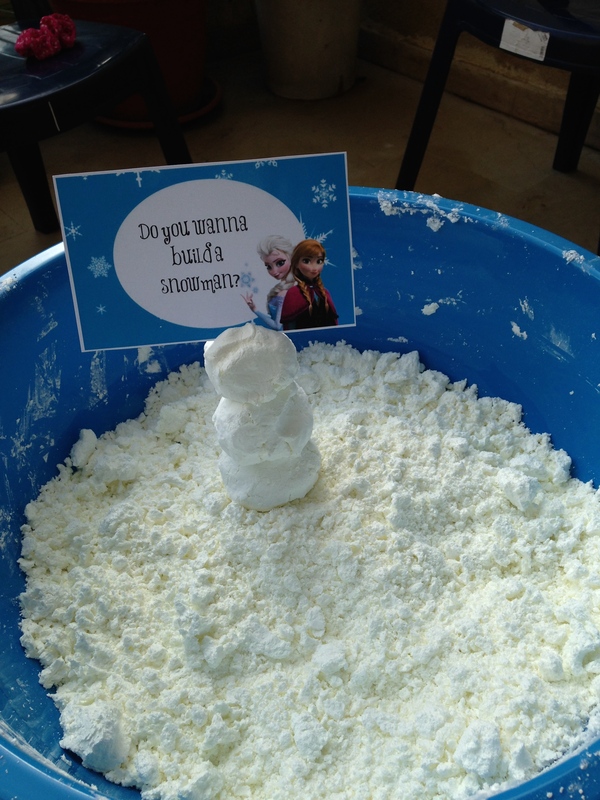 We had play snow, ice painting, a frozen dancing game and a scavenger hunt using song lyrics from the movie. 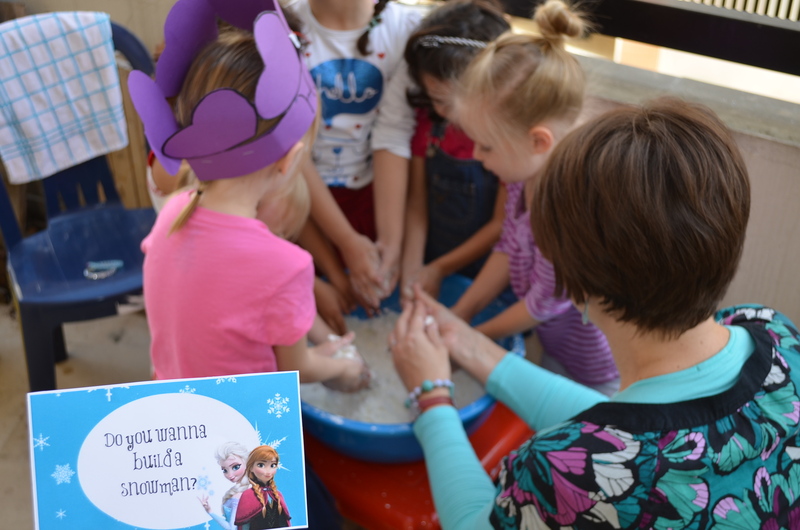 We also played Frozen Bingo, which was a huge bust – the kids got bored really quickly. But my girls have played it nearly every day since then, so it wasn’t a complete loss. 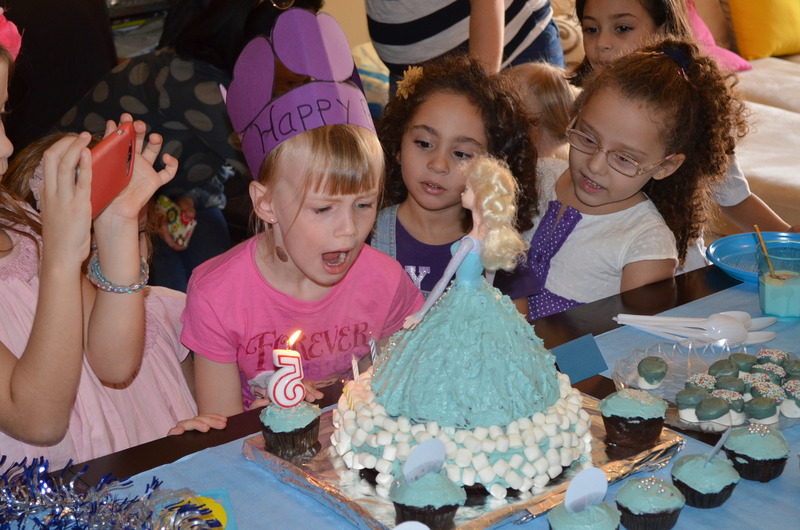 Party food and games aside, my big five year old was most excited about having all her friends come over and celebrate… Isla was so happy and had a great day, which is really all that matters in the end! Before moving here, we just assumed that any kids we had would grow up speaking Arabic fluently. 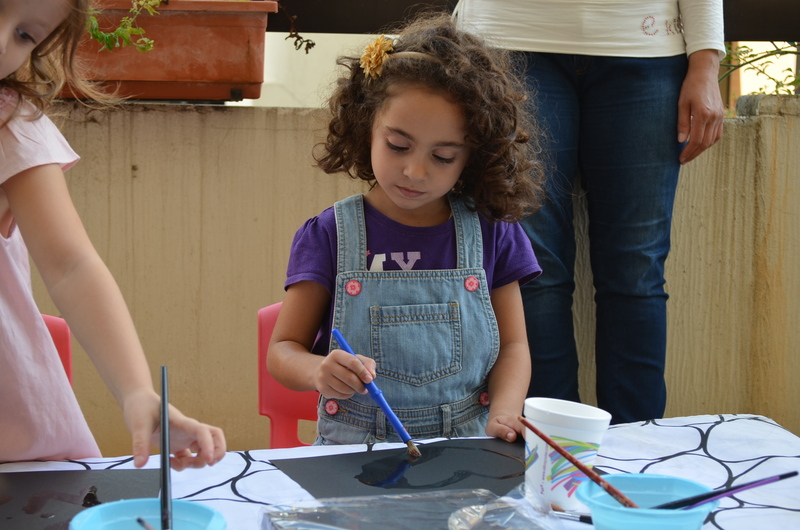 We found out pretty quickly that living in the part of Beirut we do, it was going to take a lot more work for them to pick up the language than just the community exposure. As soon as people see our girls’ light eyes and hair, they speak to them in English or French and are generally surprised to find out that they do in fact understand Arabic. And even if I continue the conversation in Arabic, or prompt my kids to respond in Arabic, the conversation usually continues on in English. Isla learned very quickly to tune out any Arabic around her, because chances were pretty high someone was going to repeat everything for her in English. This worked great for her… she’s a perfectionist, afraid of trying new things, shy and definitely does not enjoy being put on the spot. So for her to try out words in a language she knew she wasn’t as strong in was just not going to happen. Plus she never needed to try, because someone was always more than willing to jump in and ask her the same question or tell her the same story in English. So while her comprehension was decent, she had a really hard time composing sentences that weren’t just memorized phrases. We’ve noticed huge progress in her Arabic in the past year and a half or so. School has helped for sure, and she also had a tutor last year who worked on her spoken Arabic (different from the Arabic she was learning in school). I think the biggest thing it gave her was confidence – that she actually does understand and she can speak and be understood – and she’s been using her language a whole lot more this past year than she has before. It also helps that there are a few situations she’s regularly in now where English is not really an option for her, and I’ve been surprised and how willing she has been to try to speak Arabic, even if it isn’t perfect. Then there is Ruby. She and Isla couldn’t be more opposite personality wise and it’s been so interesting to see how this has affected second language development. Ruby could care less if what she is saying is wrong, she just wants to talk to people. I’m actually glad that Ruby isn’t further along in her Arabic. It’s really nice that not everyone around can understand when she asks me loudly, “why is that lady old?? ?”… but I do think that she’s going to jump into conversations much quicker than her sister did, just because she is willing to take the risk and try. TCK in transition. But not really. We’re taking a little vacation tomorrow. So excited to have nothing to do but sit on the beach, swim in the pool and of course, take a trip to Ikea! The girls are excited too… it’s been really interesting to see Isla “prepare” for this trip. Our little TCK is getting to be a pro at transitions. We’re so thankful that our organization takes the time to teach our kids how to come and go well, and how to find their identity when they don’t seem to fit anywhere. But I think Isla is taking things a little overboard. She’s so wound up about traveling that she is literally out of control of herself. She can’t sleep, her emotions are all over the place, she’s just not herself. The second reason is her personality. She is shy and she’s a perfectionist, two character traits that make learning a language very difficult. Caleb and I both attribute our relative success at learning Arabic to the fact that we weren’t afraid to just go out and speak, knowing we would make a million (and more!) mistakes. But Isla wouldn’t even try to speak unless she knew she could say it perfectly, and even once she was sure, she was often too shy to talk. While being in school has helped her a lot, most of the Arabic that she was speaking from school was Fussha. So a good friend of ours has been tutoring her in Lebanese Arabic once a week. It’s made an amazing difference, more in her confidence than anything else. She’s much more comfortable speaking Arabic, which means she uses it more, which means she gets better and better. Getting a good base in a second language makes it easier to learn a third and even fourth language. I’m amazed at how good her French accent is, although she really only knows phrases and songs that she’s learned at school. I also die every time she speaks school English. Somehow her brain has differentiated between the English she hears at home and the English she uses at school, and her accent changes accordingly. I don’t know if she’s even cognizant of it, but recently her school English has been getting stronger and stronger. We’ve tried correcting her pronunciation a few times, but at this stage in the game it’s not worth the fight. She’ll figure it out eventually when she goes through her “what do you mean I’m not actually Lebanese!? !” identity crisis at some point.